Much like the popular kale chips, grape leaf chips are simply coated with oil, seasoned (salt and garlic flakes) and baked in a low oven (275 F) until crispy (about 12 minutes). They have a distinct lemony flavour, but are less substantial than the kale variety – for that reason I like them crumbled on salads, soups, rice, etc. or in a sandwich. Just note that if they sit in a salad or any other sauce, they do lose their crispiness and their flavour, so it is better to add them at the last minute. Categories: edible weeds, recipes, snacks | Tags: chips, foraging, grape leaves, snack | Permalink. Having just recently learned that all parts of the milkweed plant are edible at different times, I have been too late to experiment with the early spring sprouts. I did fry some young leaves in June and some fully-bloomed flowers a little later – both were good but just experiments without actual recipes. 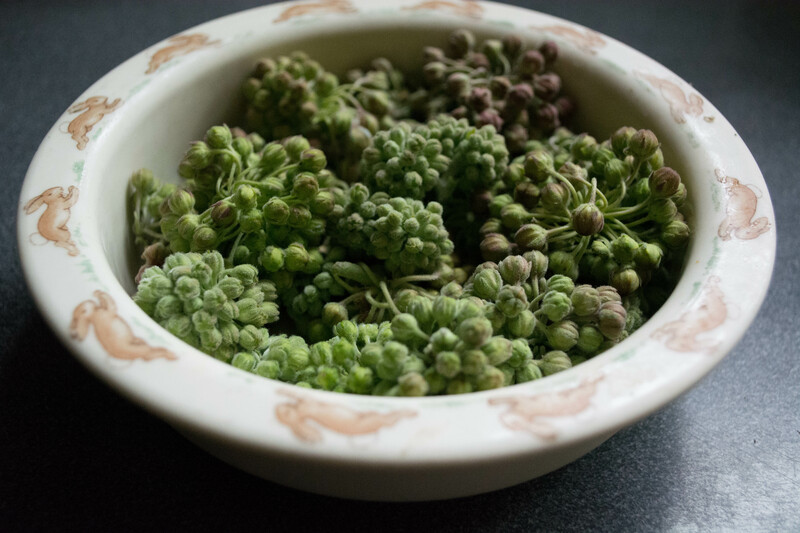 The flowers are beginning to wilt now, but there are still a few young plants, and the flowers before they bloom are supposedly tastier, so I came up with this very simple soup recipe. 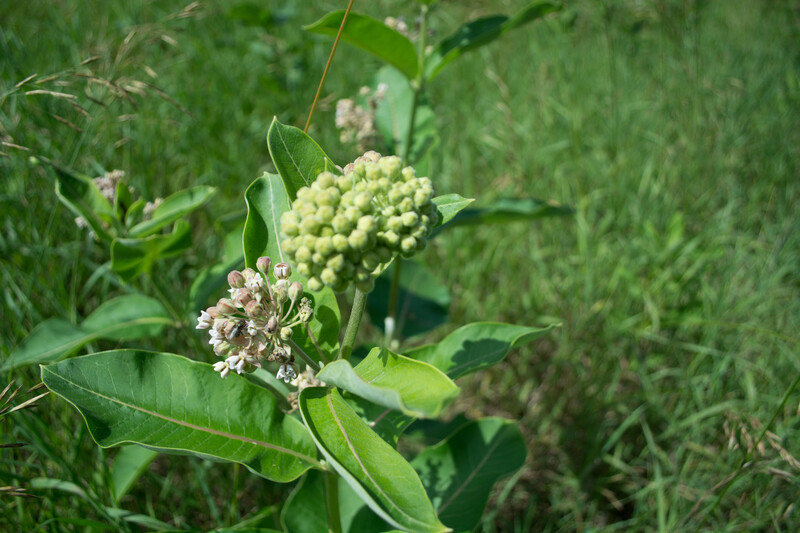 Before going any further, I should mention that you need to make sure you can properly identify milkweed. If you have it in your garden, you probably know what to look for, but otherwise you should check with someone who does know, as there are other, not so edible plants which are similar. Also, I am always careful to encourage milkweed as it is beneficial to monarch butterflies in particular, and many pollinators in general. I sometimes have to pull them out of my vegetable patch, and otherwise I allow myself only one or two blossoms a plant, so there is still plenty left for the butterflies. Not all the flowers turn into pods (I hope to have recipes for those soon), so the plant won’t miss a couple. 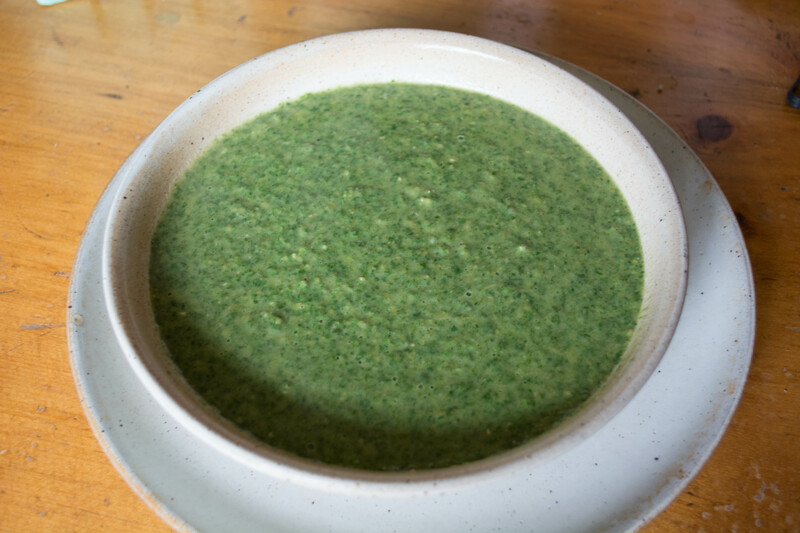 Other than those considerations, the soup is very easy to make, vegan (unless you choose to use milk in place of the nut milk) and contains almost all foraged plants, which means it is inexpensive and super good for you. If you are not sure about lambs quarters, refer to my previous post on these here. Fry the onion and garlic in the oil on medium heat until the onion is soft, but not browned. Add the flowers, potato and chick peas and simmer for about 10 min, until the potato is soft. Add the herbs, salt, pepper and lambs quarters, and simmer until the greens are cooked (about 2 minutes), stirring to make sure they are cooked evenly. Add the milk (I used almond) and heat through. Blend it in a food processor or blender. Serve hot. Categories: edible weeds, recipes, soup | Tags: edible flowers, edible weeds, foraging, lambs quarters, milkweed flowers, recipe, soup, vegan | Permalink. 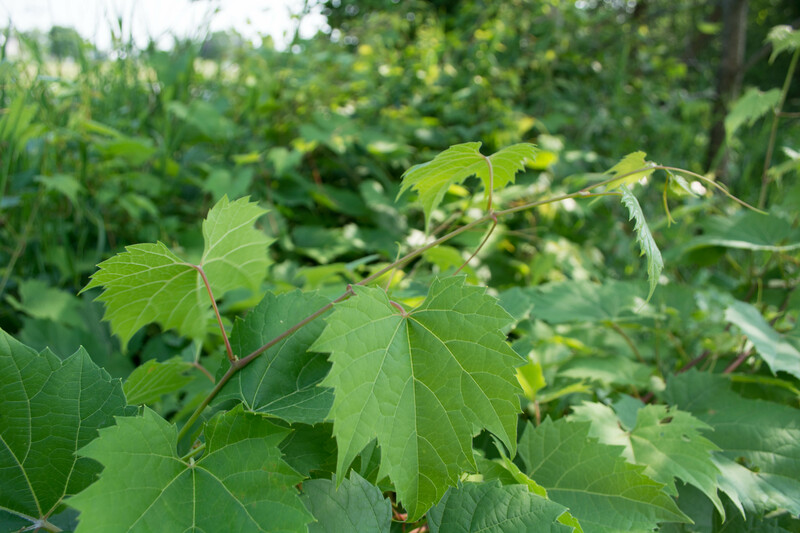 Now is the perfect time to collect grape leaves in our area. 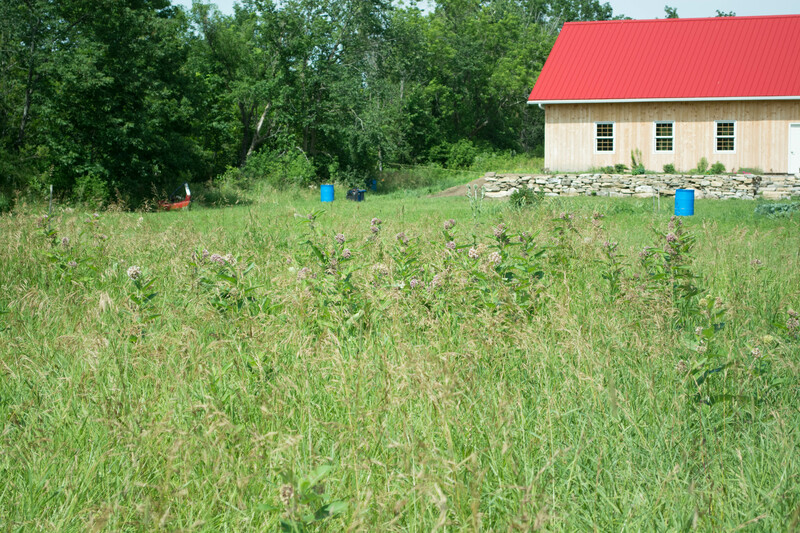 You can collect any variety of grape you like, but the ones I am talking about are wild and grow everywhere on our property. They are easy to identify, easy to pick and the easiest of all to store. I usually just blanch them in boiling water, then stack them in plastic bags and keep them in the freezer where I try to store enough to see me through to the next year. I hope to come up with some new recipes, or at least ideas, to use these. I will begin with a recipe for dolmas which I made in the slow cooker. Dolmas are simply stuffed grape leaves and are a common dish in Middle Eastern and Greek cuisine. I prefer the vegetarian variety because the herbs, garlic and olive oil dominate the flavour and go so well with the unique flavour of grape leaves. You can make these in a regular pot on the stove too, but in that case I recommend lining the bottom of the pan with a layer or two of sliced, raw potatoes, then piling the dolmas in, placing a heavy plate or board on top, pour water to cover the dolmas, cover the pot and cook on a low heat until the water has all be absorbed. The nice thing about this method is you get some pretty nice potatoes to boot. Here are the grape vines at the end of our drive. For this recipe, you will need about 60 leaves. Choose ones which are about 3 inches broad at the widest part, ones which are unblemished and still young-looking (the older leaves are darker green). 1/2 cup cooked or canned chick peas, coarsely chopped. Mix all these ingredients in a bowl. Lay the leaves out flat, vein side up, and place about 1 tsp of filling near the base. Roll them up one turn, then fold in the sides and continue to roll. They should be firm but not too tight, as the rice will swell with cooking. Place them in a slow cooker, touching but not pressed together. Pour over them 2 1/2 cups of water, which should just barely cover them. Cover and cook on automatic for about 4 1/2 hours or until all the water has been absorbed. Serve hot, cold or in between with plain yogourt or sour cream. Categories: edible weeds, recipes, snacks | Tags: chick peas, dolmas, foraging, recipe, stuffed grape leaves, vegetarian, wild grape vines | Permalink.